Stopping was not as easy, since I had to remember BTsync PID (or grep ps -aux for it) and then use kill command. Thanks to jcollie post on BitTorrent Sync setting service for Btsync was a breeze. But let’s first see how I actually installed BTSync. Make sure that you pick the latest build from Forum topic that is pinned at the top and is meant to announce the latest build with the proper link. Do NOT download BTSync from the front home page if you wish to work with the latest version with the least amount of bugs. You can setup other options but this is out of the scope of this post. 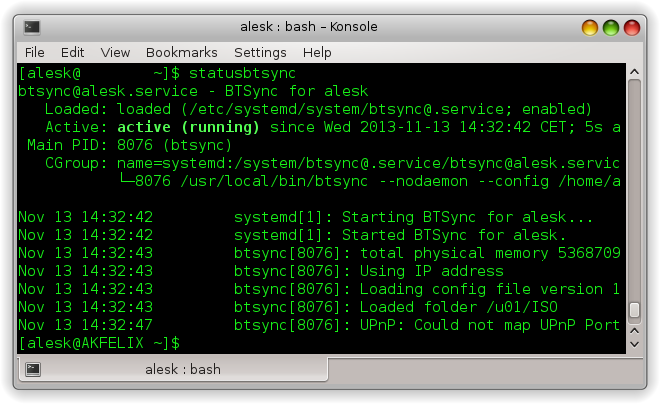 Let’s see now how can we start btsync as a service for one or more users of local workstation. Posted on 13.11.2013, in Linux, PostgreSQL, etc. and tagged Linux. Bookmark the permalink. Comments Off on Running BitTorrent Sync on Fedora 19 as a service.